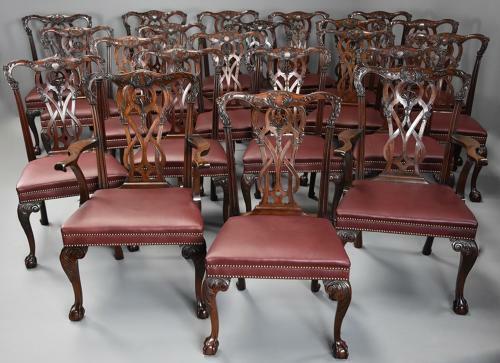 This superb set consists of two armchairs and nineteen single chairs, each of the chairs consisting of a shaped top rail with carved scrolling acanthus, rosettes, foliate and floral decoration with gadrooned collar to the top of the graduating and moulded uprights. The central back splat being pierced, carved and intertwined with superbly carved anthemion above carved harebell and foliate decoration to either side, the armchairs having shaped and moulded arms. The seats upholstered in a plum colour leather, upholstered onto beech rails and secured with brass tacks. The chairs are supported by carved cabriole legs to the front having carved scrolling acanthus to the top terminating with carved ball and claw foot with outswept legs to the back. This identical set of chairs were handmade by good cabinetmakers in the same workshop, they do have slight variations in the size of the ball and claw foot which is to be expected. This superb set of chairs are in excellent condition for age and have the colour of 18th century Chippendale chairs, they are of stable construction and can go straight into a home. Information: we have a photograph of a dining room where the same design chairs are shown around the table - the image in a scrap book from Frederick Tibbenham Cabinetmakers in Suffolk, the image possibly taken from an early edition of 'Country Life'.